« Good Things & Scrap Swap?? Yesterday, among other things, we went to the Living History House at the Museum of the Rockies. 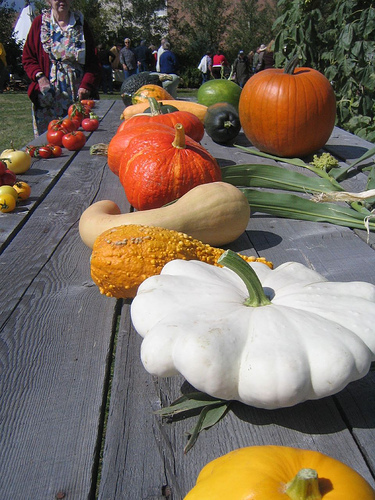 It was their big Farm Day (the last hurrah before they close for Fall/Winter) and there were lots of old-timey demonstrations, including felting, cider-making, corn grinding, blacksmithing and leatherwork. Not to mention the bluegrass and the women quilting and crocheting. We had a lot of fun walking around the farm and checking out the produce. Above, Paul picked a crabapple high on the tree for me. It was good. They also had all sorts of produce for show, like this table full of squash. Yum! One day I would like to have my own little garden. It was exciting to see all of the squash hidden in the field, even though they weren’t mine! 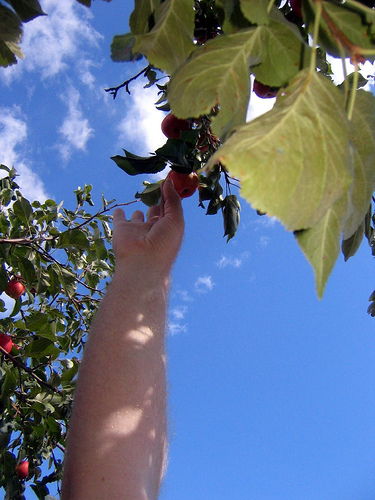 what a pretty picture that is, reaching for that crab apple! that sounds (and looks) like a great day!